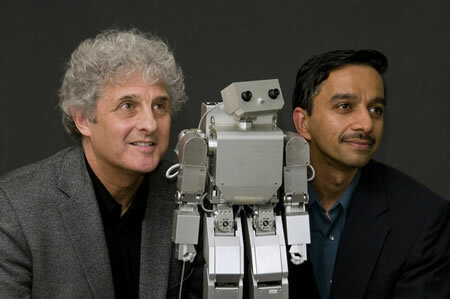 Morphy, a small metallic robot, was programmed to copy basic human social skills. An experiment was devised to test whether or not babies would interact with the robot in a manner similar to the way they interacted with people. During the experiment, 64 babies individually sat on their parents' lap facing Rechele Brooks, a co-author of the UW study. The babies played with toys for a few minutes to get used to the environment and then Brooks revealed Morphy, who was hidden behind a barrier. Following a script, Brooks said, "Oh, hi! That's our robot!" and asked Morphy if it wanted to play a game. Controlled by a researcher hidden from the baby, Morphy responded by waving its arms and shaking its head. Brooks then asked, "Where is your tummy?" and "Where is your head?" and the robot pointed to its torso and head. Then Brooks demonstrated arm movements and Morphy imitated them. All the while, the babies watched, looking back and forth as if at a ping pong match. Then when Brooks excused herself from the room, researchers measured whether the baby would interact with and take cues from the robot as if it was a sentient being. When the robot looked at a toy in the room, 13 out of 16 babies, who had watched the robot play with Brooks, followed the robot's gaze as compared to a control group in which babies did not see Morphy engage in games. Only 3 of 16 of these babies turned to where the robot was looking. "Remember, the robot did not directly interact with the child. The child simply observed as the adult and the robot communicated," said Meltzoff. "Yet, they were deeply influenced by what they saw." Nanny was built in the shape of a sphere, a large metal sphere, flattened on the bottom. Her surface had been sprayed with a dull green enamel, which had become chipped and gouged through wear. There was not much visible in addition to the eye stalks. The treads could not be seen. On each side of the hull was the outline of a door. From these the magnetic grapples came, when they were needed. The front of the hull came to a point, and there the metal was reinforced.